Strawberry Belle Farms and came back with a gallon of yummy strawberries (Thanks Shaun!). So we decided to make muffins this weekend. Thanks to Barefoot Contessa for her inspiring recipe!! 3) In a glass bowl, combine the milk, eggs, melted butter and vanilla. 4) Make a well in the middle of the dry mixture and pour the wet mixture into the well. Stir until just combined. There will be some lumps but don't overmix the batter!! Add the strawberries and sugar and stir gently to combine. 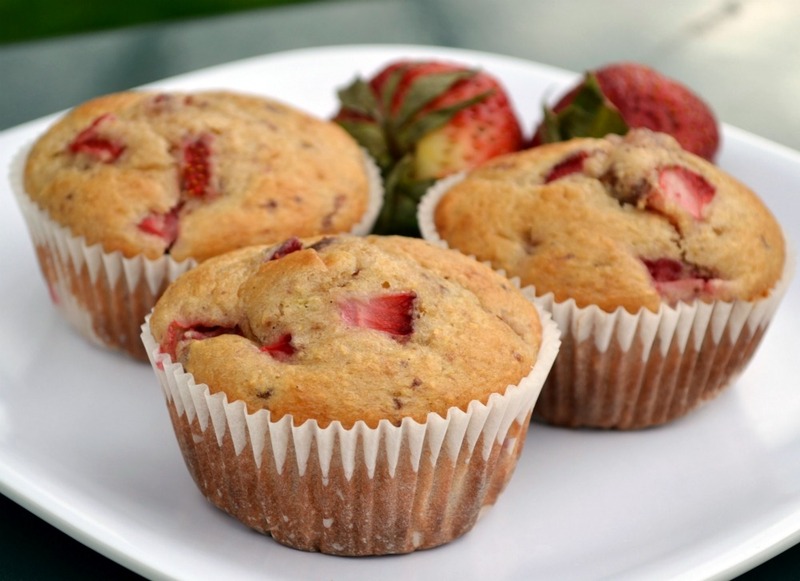 5) Using a 2 1/4-inch ice cream scoop, spoon the batter into the muffin cups to fill the liners. Bake for 20 to 25 minutes, until a cake tester comes out clean and the tops are nicely browned.